Hey my name is Nancy . I am seeking a pet sitting professional available in Chesapeake, Virginia near 9Round in Greenbrier/Greenbriar mall area. Looking for someone with a fenced in yard with a dog friendly dog for my large pup to play with. 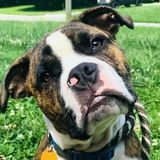 Ace is 6 month old boxer/bulldog mix. He is use to playing with medium to large dogs. He is a service dog in training and needs an outlet for his pent up energy while mom works out. He has all his shots. Need an extended play dates 3 afternoons a week from 3-6.